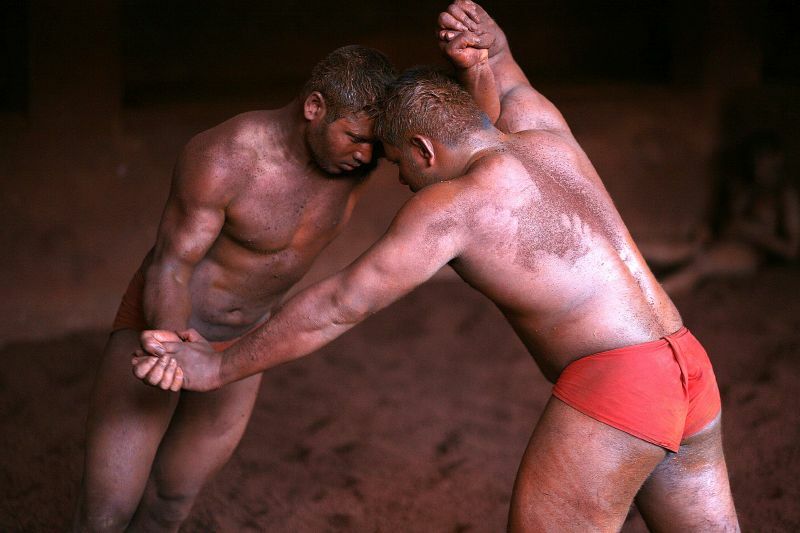 This ancient wrestling game from South Asia combines speed, strength, and stamina. Think of kushti, a traditional sport of Pakistan, India, and Bangladesh, as a combination of the strategy and smarts of karate and the down-and-dirty theater of mud wrestling. Royal families of the region patronized the sport in the 1600s, but it remains a popular game of speed, strength, and stamina. A match (called a dangal) lasts 15 minutes to an hour or more (as compared to a typical Western wrestling match that includes three, three-minute periods). 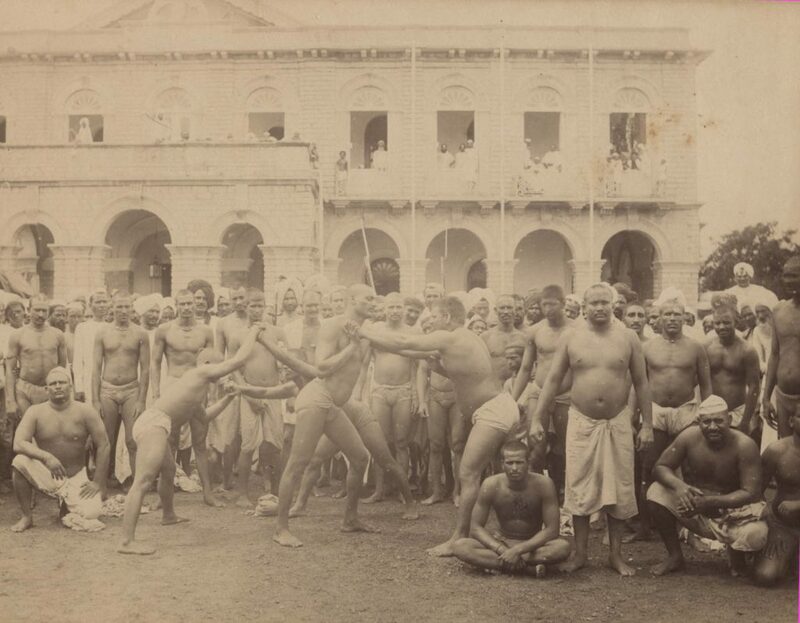 A kushti match from 1870 (photo courtesy of Wikimedia Commons – public domain). 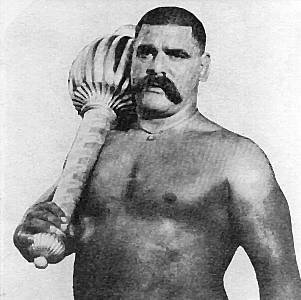 The great Gama Pehlwan who was awarded the Indian version of world heavyweight championship in 1910. He remained undefeated throughout his Pehlwani career spanning 50 years (photo courtesy of Wikimedia Commons – public domain). Qaiser Khan, 37, a professional pehlwan (wrestler) from Lahore, Pakistan who earned the title of Sher-e-Lahore (Lion of Lahore), began playing the sport at 11 years old with the urging of his father. He was sent to live under the patronage of a guru (mentor). Pehlwans follow a strict routine of exercise and diet overseen by coaches and mentors. “We were woken up at the crack of the dawn to exercise for hours,” he says. “I dreaded that time.” The exercises included dand (pushups), bethak (squats), and dura (a combination of pushups and situps). After doing some exercises at home, they would go to akhara (the local gymnasium featuring a mud pit) to practice. By the time they returned, they would have completed nearly 3,000 dand, bethak, and duras. Wrestlers would consume sardai, a drink made of almonds, milk, and herbs following the intense workout. A pehlwan’s diet also includes meat, ghee (clarified butter), and flatbread. In the afternoon, they prepared for another workout round, which began by going to the akhara and digging up the mud pit with the hoe. Then, pehlwans would plough the akahara to make the ground leveled and soft. However, instead of using an animal to prepare the area, one of the pehlwans would be harnessed to the plow and a few people would ride on it to increase the difficulty. After the akhara was ready, they would begin to practice the game, which would continue until 7 p.m. Younger pehlwans, eager to learn, observe as the senior pehlwans engage in training. (photo courtesy of Nevil Zaveri). On competition day, fans place huge bets on wrestlers. Pehlwans arrive at the pit amid the cheering crowd and traditional drum (dhol) beat wearing their loin cloths. The mud is often mixed with oil, or ghee, and ochre that imparts a red hue. It is prepared carefully with a routine sprinkling of water so that the floor is not hard enough to cause injury, but not soft enough to impede movement. The game is simple, yet challenging — pin your opponent to the ground. There are three primary moves daw (moves), pech (countermoves), and pantra (stance). 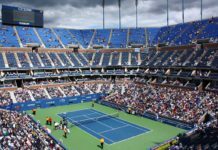 During the game, each player tries to put the opponent on their back, and whenever a player succeeds, the referee taps the player to let him know that he has won the game. There are no points, penalties, rounds, or timeouts. 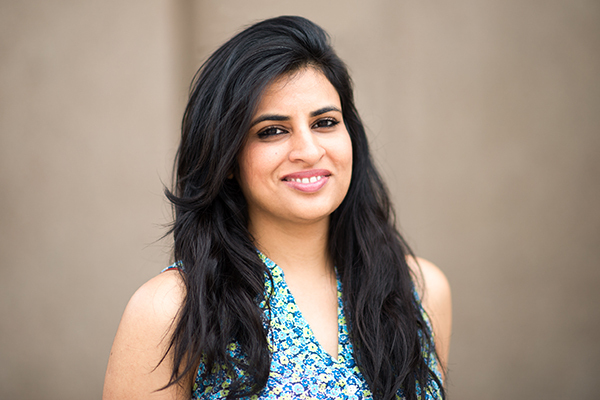 Srosh Anwar is a web and digital manager and a contributing writer at Fan First. She worked with two national newspapers and later as an independent photographer in Pakistan before moving to U.S. to complete a Masters in Magazine, Newspaper and Online Journalism at Syracuse University. Storytelling is her passion which she fulfills using different mediums – photography, writing, and graphic design. She likes to write about diversity, immigration, education, and women rights. She was the Social Media Contests Winner at Women Deliver Conference in 2013 for her photography. She also worked on the youth version of UNESCO’s Education for All Report as part of a team of twelve young editors from around the world. She is a fan of Pakistan’s men’s and women’s cricket teams and her favorite sports memory is Pakistan winning the Cricket World Cup of 1992. Just beneath, are many totally not associated web-sites to ours, nonetheless, they are surely worth going over. Check beneath, are some totally unrelated websites to ours, on the other hand, they’re most trustworthy sources that we use. will amitriptyline help headache right away? We prefer to honor quite a few other online sites around the web, even if they arent linked to us, by linking to them. Under are some webpages worth checking out. Wonderful story, reckoned we could combine some unrelated information, nevertheless actually really worth taking a appear, whoa did 1 discover about Mid East has got more problerms too. Beneficial material. Thanks a lot!